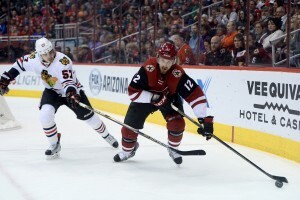 This week on our list of players that Vegas fans should be watching from the around the NHL ahead of this summer’s expansion draft, we are taking a look at the Blackhawks. There’s not a lot of guesswork to be done in Chicago. The non-movement clauses on Chicago’s roster numbers eight. Most simply, if the Blackhawks would like to retain the services of Marcus Kruger – which it is widely assumed they do – they have just one question to answer. Offense or defense, who gets exposed? We’ll give you a pair of names from both sides of the ice. 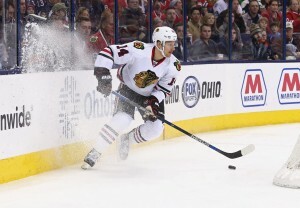 Kruger may be the reason that Richard Panik gets protected. Don’t get me wrong, you could argue he’s earned an exemption on his own merit, but protecting Kruger means Chicago is pursuing a route where they cannot protect a defenseman beyond the three with NMCs. So there’s not a lot to figure out. At 25 years old, Panik came to Chicago following a trade with the Toronto Maple Leafs that sent Jeremy Morin the other way. 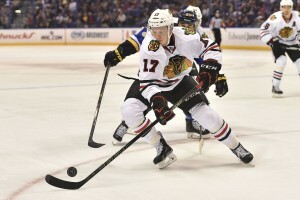 In his first season as a Blackhawk he scored six goals and eight points in 30 games. This season he has 11 goals and a career high 22 points through 54 contests. Smart money is that Panik is one of the forwards retained. If he’s not, he’d be a fantastic addition to the Golden Knights. At six-foot-one, 208 pounds with great scoring instincts, Vegas fans should tune in to some Blackhawks games for the remainder of the season just to check out this guy. McNeill has a grand total of 13 minutes of ice time with the Chicago Blackhawks. That wasn’t exactly the plan when they burned the 18th pick in the 2011 NHL Draft on the winger from Langley, British Columbia. To be clear, if Kruger gets protected by Chicago, then it’s basically two of three – Panik, McNeill, or Dennis Rasmussen. You can watch him as well, or maybe even Ryan Hartman. Watch him too. You should probably bookmark this page. To this point, Chicago just hasn’t been able to pull the trigger on calling McNeill up to the big club. Meanwhile, he’s putting up impressive numbers in the AHL. Two seasons ago McNeill racked up 44 points in 63 games for the Rockford IceHogs. A season ago he went for 48 points in 64 games. This year he’s at 26 points in 47 contests. The door is closing on McNeill getting a shot in Chicago. Something has to give. Chances are he’ll get called up for a regular stint, or they’ll move him. If the Blackhawks go with Panik, Kruger, and Rasmussen, you can expect to see him in a Golden Knights uniform next October. So now, on to the defense. If I didn’t do a sufficient job of confusing you earlier, let me try again. Basically Chicago can go offense or defense with expansion draft protection, not a combination. So if Trevor van Riemsdyk is made available, it’s because the Blackhawks elected to not expose three forwards. With good size, a good shot, and roughly 130 games worth of NHL competition on his resume, van Riemsdyk could be a safe place to start for the Golden Knights on the backend. Inconsistent play is why he finds himself on a list of those potentially headed out west. He may have the opportunity to play his way off of it the rest of the season, however unlikely that may be. Chicago signing Brian Campbell last offseason provides a pretty good indicator of where the team thinks van Riemsdyk fits. He certainly can occupy a role on the Blackhawks depth chart, but he’s not worth protecting at the risk of losing one of its high-potential, young forwards. So if van Riemsdyk is made available to Vegas, in all likelihood, Ville Pokka would also be eligible in the expansion draft. If it’s Pokka or van Riemsdyk that go unprotected, I think Pokka is the name Vegas needs to call. Last season in Rockford, Pokka compiled 45 points in 76 games. He’s fallen off this season, however, with just 18 points through 47 games. His slide down the Chicago depth chart needn’t turn over Vegas fans. 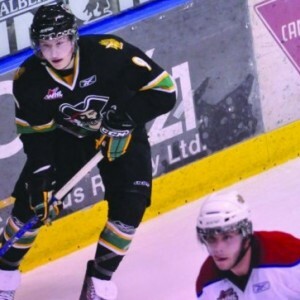 The Blackhawks are a deep team, and Pokka is a player that would not be exposed on plenty of other franchises. The entire IceHogs squad is struggling this year, so consider that when evaluating Pokka as a fit in Vegas. Get used to typing his name in your search engine, though. You should track his progress in Rockford as I think the 22-year-old from Finland will be a member of the inaugural Golden Knights squad.